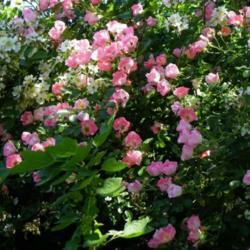 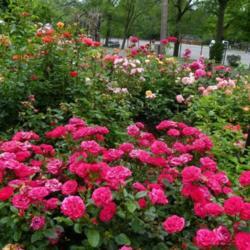 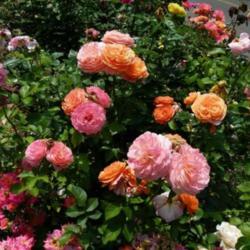 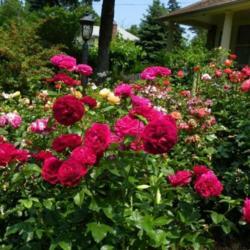 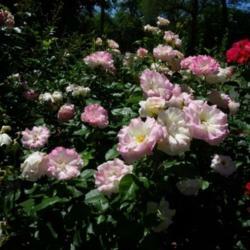 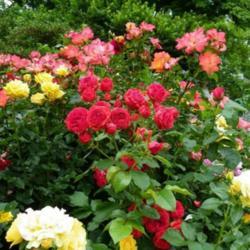 I love my roses, but I have never cared for the look of any formal type of garden, not even rose gardens. 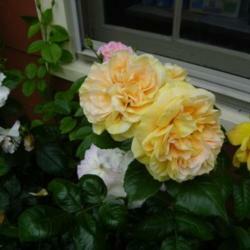 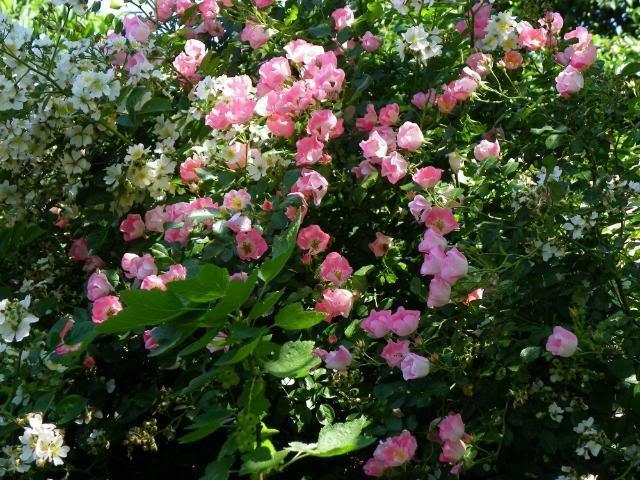 Instead, I have planted my many roses informally in my garden, which is very much a cottage garden. 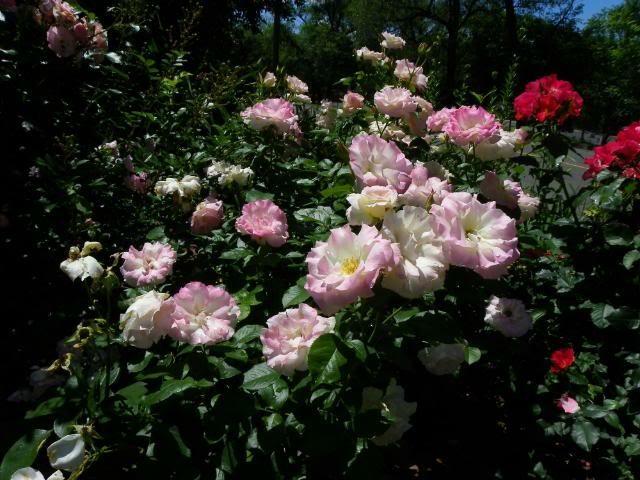 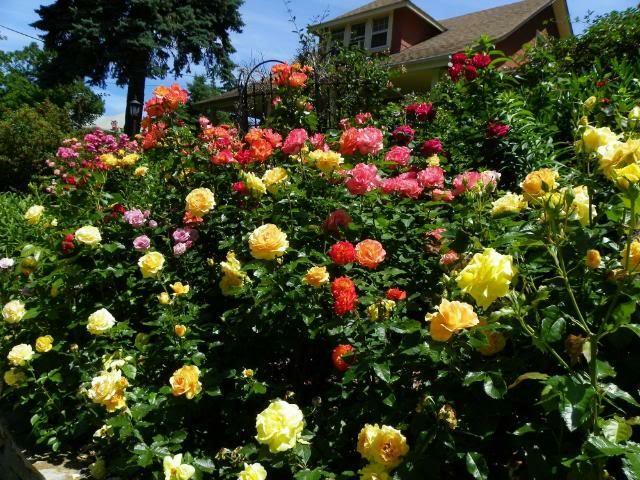 Take a picture tour with me to see my roses. 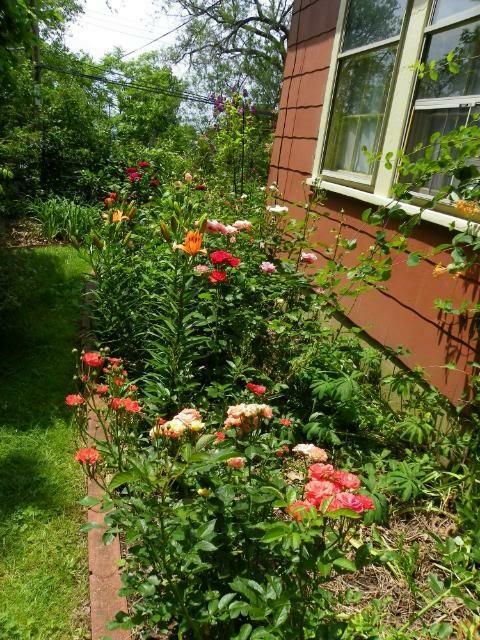 Roses share space with lilies in my southside rose garden. 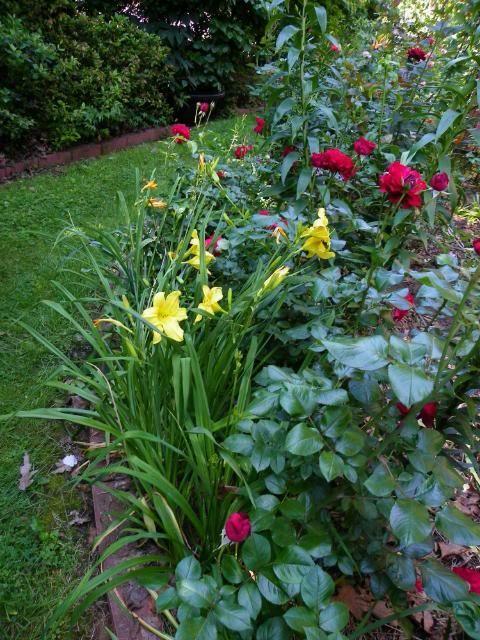 Another area of the same southside rose garden, showing early-blooming daylilies alongside the roses. 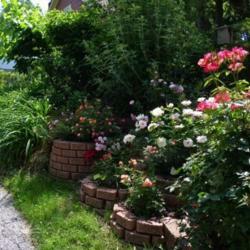 More of the southside rose garden, where one can see the grassy path and the shrubs across the way. 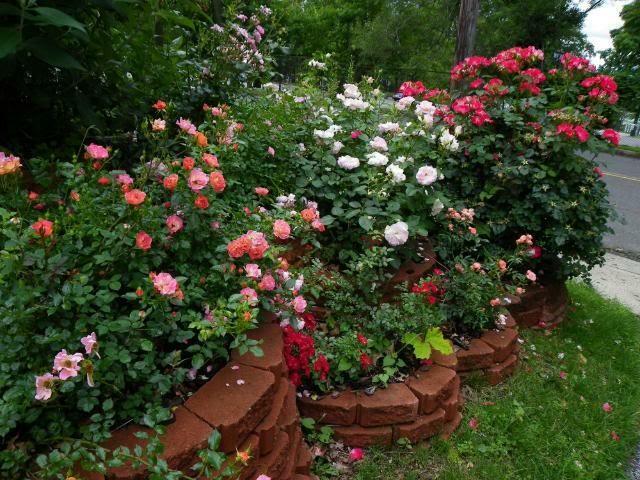 My backyard patio, which has a hill behind it, is lined with roses. 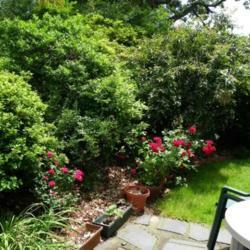 Gizmo shares space with shrubs farther up the hill. 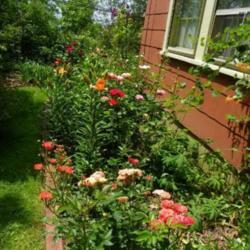 Even the side of the patio nearest the house has roses. 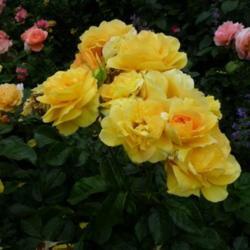 This one is Golden Zest. 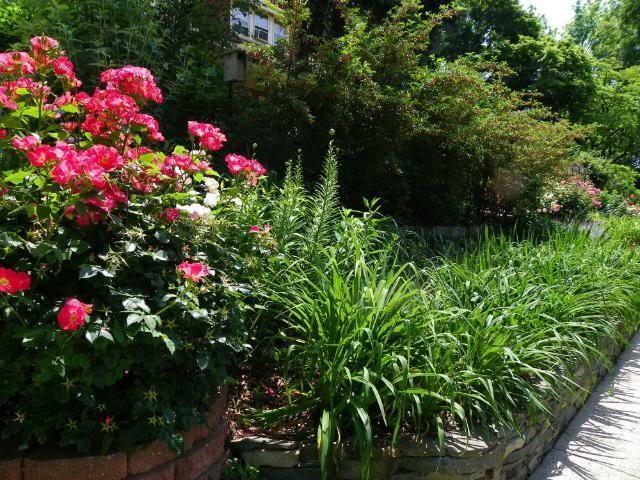 From this angle, we look across the left side of the front yard along the sidewalk. 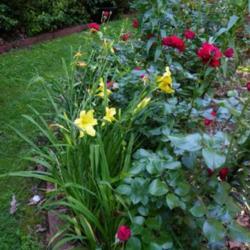 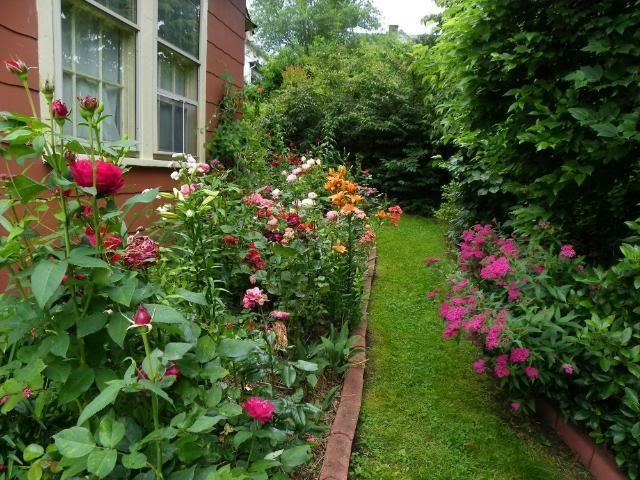 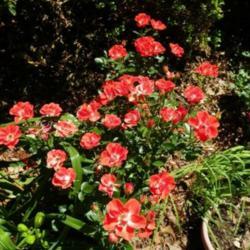 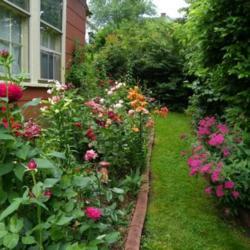 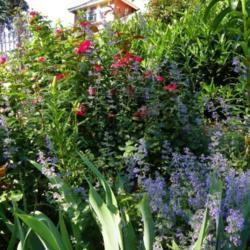 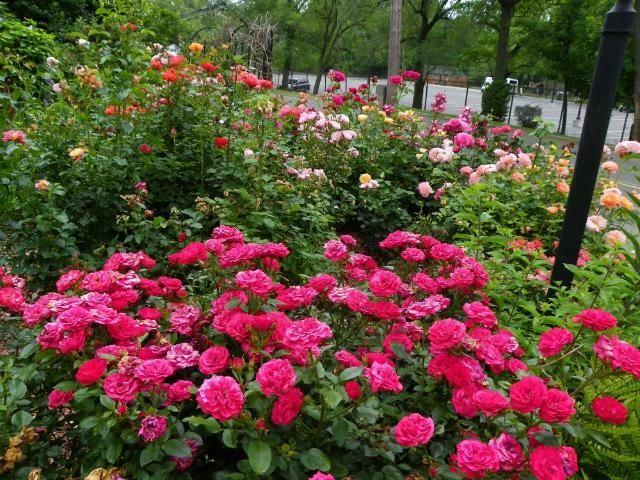 It contains roses along the very left with a bed of daylilies stretching across the front. 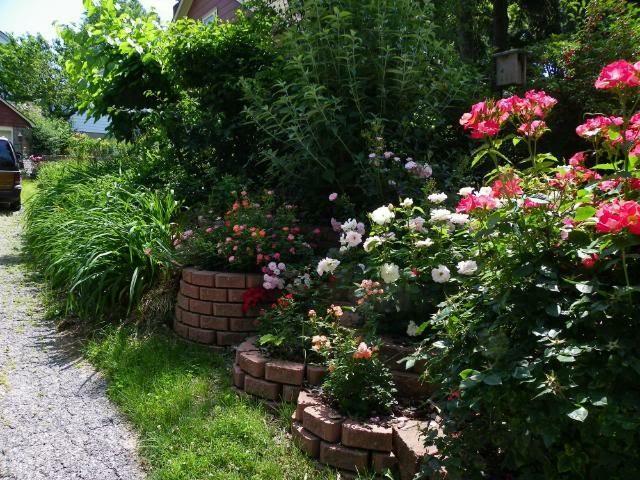 Same spot, but looking in the opposite direction, up the driveway. 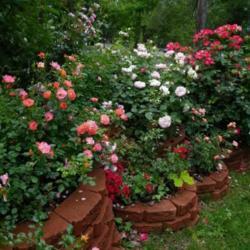 The roses there are near the street and in a series of raised semi-round beds. 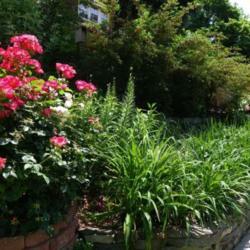 They give way to shrubs on top of the slope and daylilies farther along the slope. 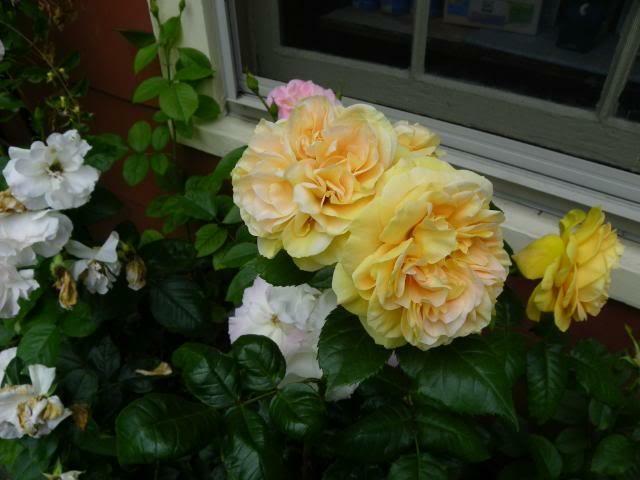 Carefree Delight (pink) blooms along with The Gift roses next to my garage. 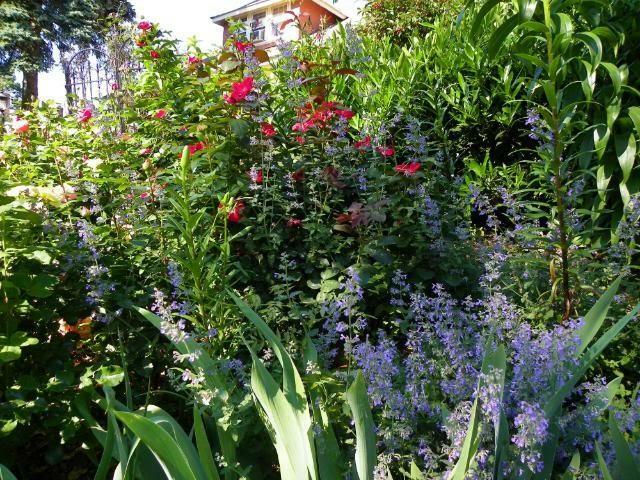 A little cottage garden corner features daylilies, lilies, catmint and Home Run roses in the back. 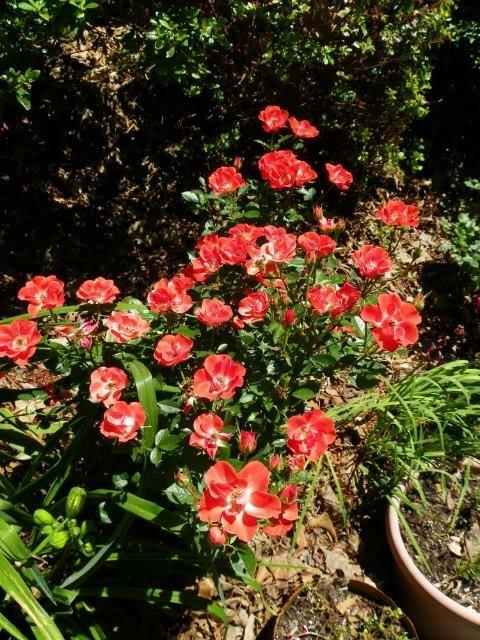 I have a section of roses planted close together in my front yard just along the sidewalk. 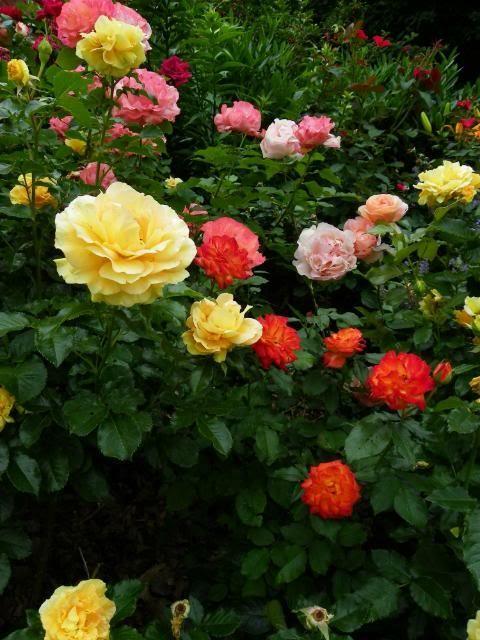 I call it "Floribundaville". 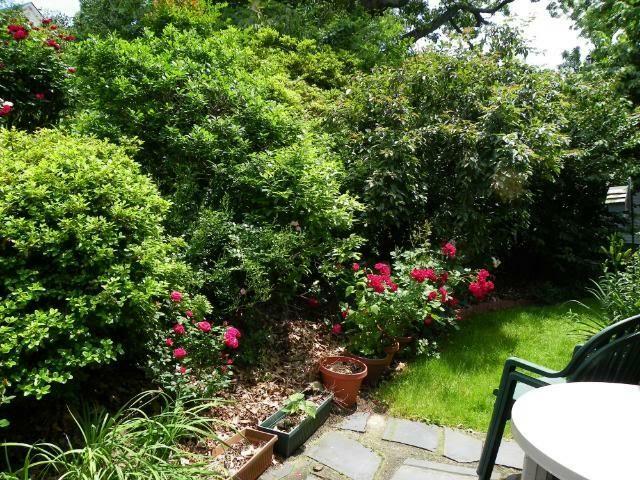 More views of the same area. 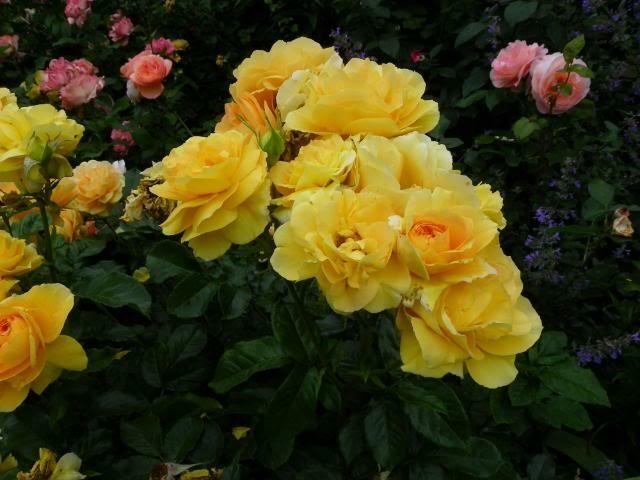 The yellow rose is Eureka. 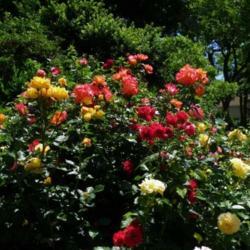 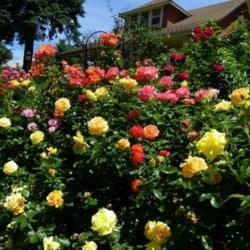 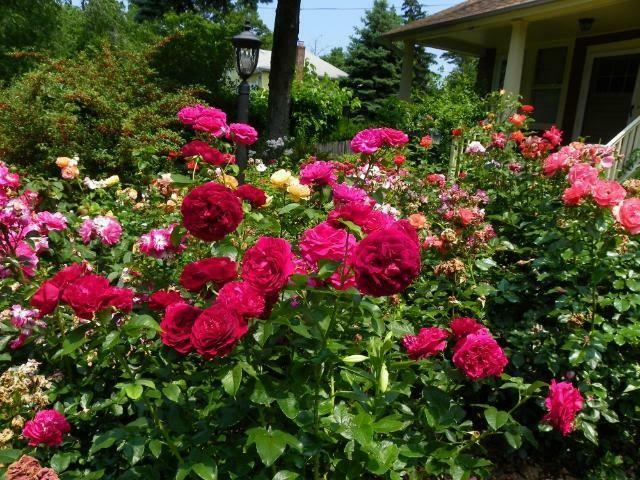 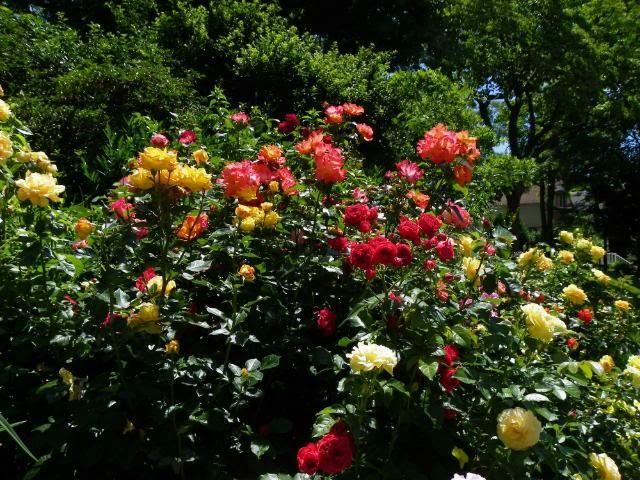 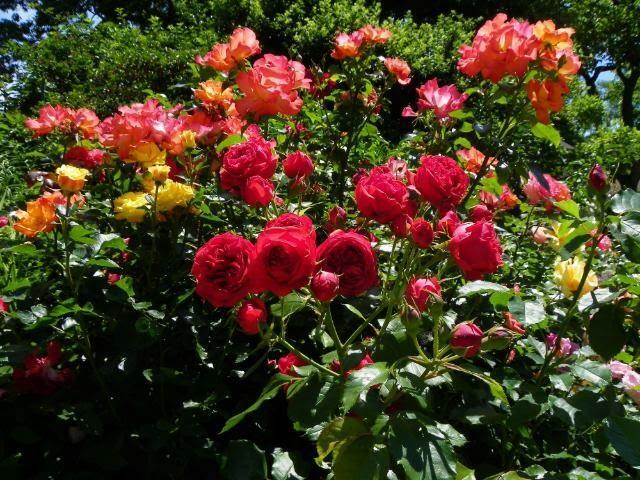 A different area of the front yard, these roses in the front of the picture are Cherry Sunblaze. 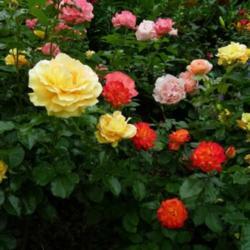 Clements shrubs and other shrub roses in the same garden bed. 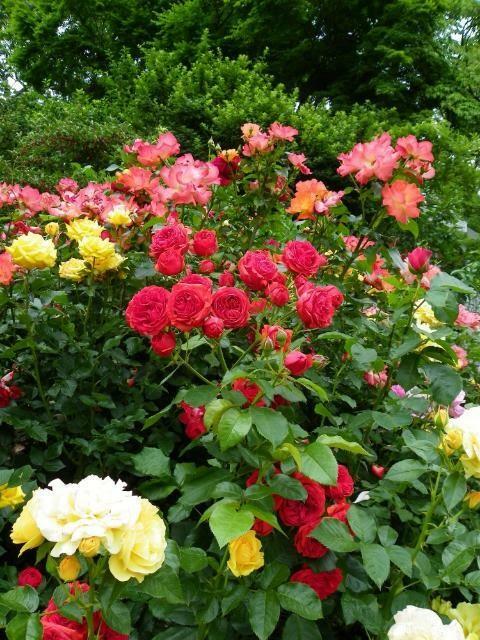 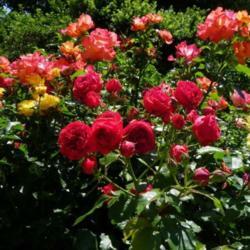 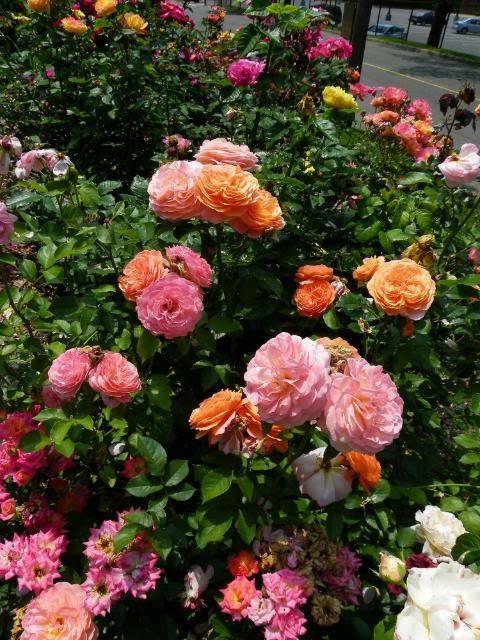 I hope you have enjoyed the tour of my gardens and that it has inspired you to plant roses in an informal way.